By Daniel Horowitz--Toronto’s Shauna Waltman was recently named as one of two North American recipients of the 2011 Young Professional Award of the Jewish Communal Service Association (JCSA). New York’s Sarah Y. Eisenman, Director of Next Generation and Service Initiatives for the American Jewish Joint Distribution Committee, is this year’s other recipient. The award, the most prestigious for young professionals in Jewish community service, will be presented to both women on Monday, Nov. 7 during the Jewish Federations of North America (JFNA) General Assembly (GA) at the Sheraton Hotel in Denver. Waltman, a 31-year-old mother of one, and an honours graduate of the Richard Ivey School of Business who will receive her M.A. in Jewish Professional Studies from Spertus College in 2012, is the director of UJA Federation of Greater Toronto’s Community Connect. "I am deeply honoured to be accepting this award and to represent the pioneering work UJA’s Community Connect does in the field of young adult engagement," said Waltman. "It is a recognition I share with the dedicated young professionals I work with and the incredible young adult leaders who have dedicated themselves to building a vibrant and meaningful community for their peers." The winners were chosen by a distinguished panel from a large and varied group of candidates nominated by their colleagues from scores of organizations throughout North America. Established in 1972, the award is given to dedicated young professionals who have demonstrated exemplary service, integrity, impact and commitment in their profession. 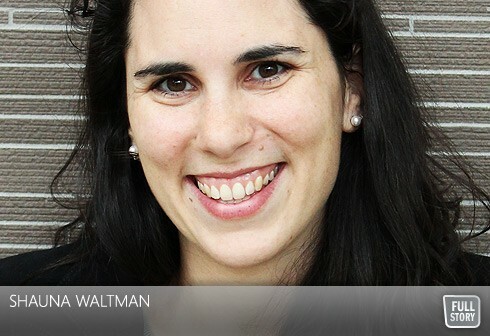 As director of Community Connect, UJA, Waltman has proven her mettle as a superb innovator, organizer and motivator. Through her vision and intense commitment, Shauna has developed strategies that are changing the way young people view their community and their identity, and has recruited and mentored new young leaders. In previous posts as Alumni and Outreach Manager, Canada Israel Experience, and National Coordinator, March of the Living Canada, she has reached out to involve thousands of young Canadians and Americans with the Jewish community at home and in Israel. "In searching for a career, I thought of law, but I couldn’t be passionate about it," explained Waltman. "Business school promised fancy salaries, but my heart wasn’t in it. I considered journalism or public relations, but nothing clicked, so I took a break and went on Birthright Israel – and that trip awakened in me something that had been part of my life, but never considered as a career path. Now I cannot imagine doing anything else. There is nothing I am more passionate about -- that every single day I get to inspire young people to create a legacy for future generations." "The qualities, passion and involvement of the many young professionals who’ve been nominated are outstanding again this year,” said Mr. Spector, who is President and CEO of JEVS, the Jewish Educational and Vocational Services of Philadelphia. “Sarah and Shauna have earned this honor through their inspirational leadership and outstanding abilities." The JCSA Award, which includes a $1,000 honorarium, is underwritten by the Andrea and Charles Bronfman Philanthropies and the Bernard Rodkin Fund of United Israel Appeal-Federations of Canada. The Jewish Communal Service Association of North America (JCSA) works with a broad spectrum of organizations in the United States and Canada to shape, define, and promote professional leadership in Jewish community service for the 21st Century.